I love the wood counter and tie in (under the sink) - What wood was used for the island counter and how was it treated. Love the flooring and the cabinet colour! What is the flooring? - What material and source for the tile - what is the size? Elephant Gray is the cabinet paint? Is that a Benjamin Moore colour? “The dresser in the dining room houses all of the owners’ best glasses and crockery,” Ashwin says. “The center section is reserved for drinks. 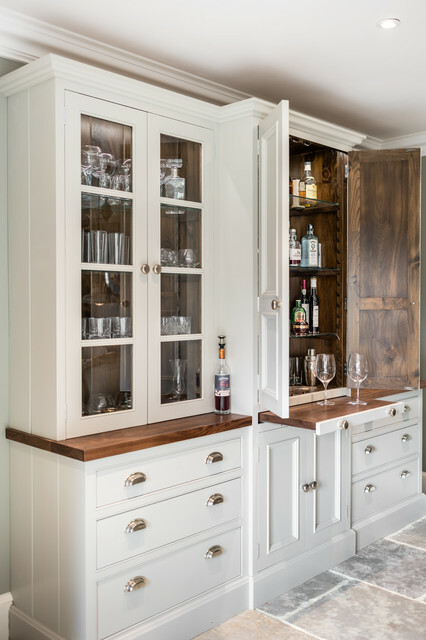 It’s mirror-backed with lights inside and has a pullout shelf for making drinks and cocktails.” The drawers and cabinet underneath provide plenty of room for napkins and tableware. Pullout work surface under steam oven? Might it be unnecessary due to counter top’s close proximity? White & Teal Matt Lacquer Kitchen.